The Burlington City Council will consider on Monday two options for replacing a downtown mural after one protester's graffiti sparked a growing stream of dissent. Councilor Ali Dieng (D/P-Ward 7) has condemned the mural as "racist" and is asking the city to remove the offending artwork and convene a commission that would replace it. In a separate resolution, Councilor Joan Shannon (D-South District) put forward a more ambiguous solution. Her proposal, which is supported by Mayor Miro Weinberger, would create a task force to "consider a wide range of options that leads to a more inclusive outcome." The 124-by-16-foot piece of art called "Everyone Loves a Parade!" depicts a host of Vermont leaders and personalities — almost all of whom are white — including Weinberger, Sen. Bernie Sanders (I-Vt.), Grace Potter, John Deere, Madeleine Kunin and Maria von Trapp. The mural, which was unveiled in 2012, stretches along Leahy Way, an alley that runs between Church Street and the Marketplace parking garage. The controversy began in October when activist Albert Petrarca wrote "Off the Wall" in black spray paint on the mural's identification plaque. Petrarca called the public artwork a "white supremacist symbol." He was cited for unlawful mischief, and later posted a video to Youtube in which he and two other men visited the mayor's office to request a change. Others have since taken up the torch. In public remarks at a Martin Luther King Jr. Day event in Burlington, Dieng criticized the mural because it does not depict members of the Abenaki tribe, people with disabilities, the gay and lesbian communities, or the 14 percent nonwhite student body of Burlington schools. He told Weinberger and Sanders, both of whom had spoken previously at the event, that they should not stand for being depicted in the "controversial" artwork. "If you cannot take the mural down, please ask them to take you away from that mural," said Dieng, who is the only nonwhite member of the city council. "We need leaders who care." The solution may not be so simple. Pierre Hardy, the artist, has said that he has no interest in amending the mural, according to Dieng. 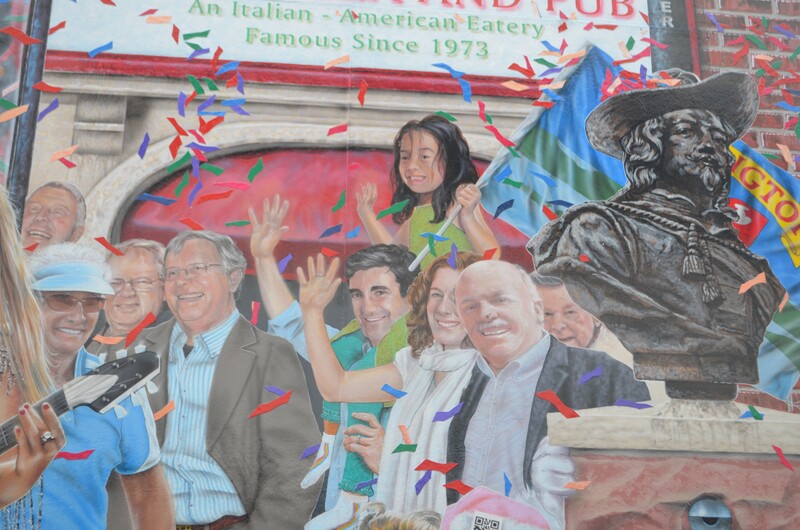 The mural was also privately funded and some businesses, including Ben & Jerry's and Sweetwaters, paid for their logos to be included in the image. Under Dieng's resolution, which is also sponsored by councilors Max Tracy (P-Ward 2) and Sara Moore (P-Ward 3), the city attorney has 30 days to consider the options to remove and replace the art. The resolution calls the mural's design an "egregious mistake" by the city. The resolution proposes the creation of a nine-member committee to design and produce an alternative piece of art. Shannon's resolution, which the council will also take up Monday, proposes a seven-member mural task force that would consider "amending the current mural, removing it and/or creating a new or additional work of art that better represents Burlington’s diversity, or other options not yet discussed." Correction, January 29, 2018: A previous version of this story misstated Mayor Weinberger's role on Shannon's proposed task force. He is not involved.